With the many advances in medicine in the last 50 years alone, dedicated professionals in the medical field have achieved greatly improved outcomes for many patients. 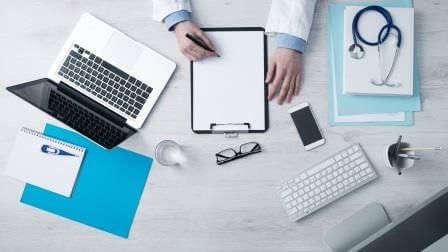 Along with these advances, however, have come increasing costs and a growing need for exceptionally skilled administrators to manage the business aspects of health care. Strong leadership skills are necessary for planning, coordinating, and supervising the functions of a health care facility and its staff. Health administrators must also have a high degree of business acumen to ensure that high-quality care is delivered within the established budget. Periodically they may be required to take actions that will reduce costs and increase profitability. Other responsibilities may include providing leadership in human resources, ensuring compliance with state and federal regulations, and serving as the first contact for any legal issues that may arise. The following is a list of websites to help you explore the kinds of opportunities available in the field of health care administration. Bureau of Labor Statistics – This government site describes the nature of health administration jobs and career outlook. Healthcare Information and Management Systems Society – You may find this organization’s website interesting if you are interested in information technology as it is used to enhance quality of care and make health care more efficient. Healthcare Financial Management Association – HFMA, whose motto is “Improving the Business of Caring,” is a resource to leaders on the financial side of health care. The site includes a variety of resources including periodic compensation surveys and news essential to the industry. Much of the information is available to non-members. The American Health Information Management Association – AHIMA is the perfect site for those interested in the organization’s mission of improving the quality of information in order to improve the quality of care. Health Leaders Media – This commercial website contains information about where the health care industry is going and contains various articles, webcasts and survey results. We link here to one particularly interesting article entitled “The Hospital of the Future,” but explore the rest of this website for other interesting material. American College of Health Care Executives – This membership organization supports health care administrators both current and future. The Ohio University MHA program strongly encourages students to obtain a student membership while they are in the program in order to be able to access the ACHE resources. Alliance for Advancing Non-profit Health Care – This site features a variety of information about the business of non-profit healthcare, including articles on executive salaries, etc. Association for Medical Imaging Management – This organization serves the needs of leaders in the field of radiology. American Hospital Association – The AHA is the premier organization representing the interests of hospitals and their leaders. Though a membership organization, the AHA website provides much insight into the careers of health administrators. American Medical Association and American Osteopathic Association – These membership organizations for doctors provide insight into the physician leader role. Health Care Administrators Association – This organization of various insurance organizations represents the interests of leaders on the payer side of the health care industry. Medical Group Management Association – This membership organization serves a variety of health care administrators in ambulatory care and medical practices. American Society for Healthcare Human Resources Administration – This organization focuses on the careers of human resource professionals in the health care field. American Medical Directors Association – This organization serves the careers of many involved in long term health care.